Saturdays year-round from 9 am to 2 pm. We're a small-scale, family farm located in Newark Valley in Tioga County, NY. ​We raise heritage & rare breed, forage-based meats, and heirloom fruits & vegetables using methods that focus on the health and well-being of our plants and animals, and the land we raise them on. 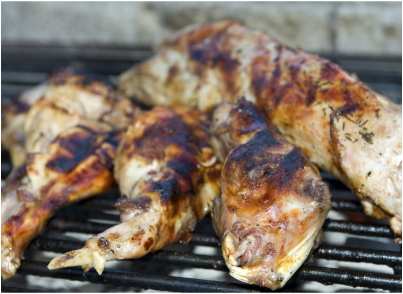 ﻿Rabbit: "The Other White Meat"
﻿People have been eating rabbit for centuries, and although it is not as commonly found in the United States, it is considered a gourmet item in most counties. Not only is it a sustainable protein source, but it also has less fat, is lower in calories, higher in protein, and contains less sodium than most other meats-- making it a great addition to a heart-healthy diet. Please feel free to email us with any questions or market pre-orders. We will do our best to get back to you as soon as possible.